My four-year-old refers to this book as ‘Daddy’s Jokey Book’. She clearly understands the ‘special’ imagination all fathers to twist everyday objects, like a set of keys, into a clever narrative device – a prop on which to build a tall tale or two; spin a yarn as long as a Taranaki fence line. In this charming picture book, Dad is tucking his daughter in for the night. But she’s distracted by his demanding job and the hours he must keep, away from her. So he tells her these fantastical little stories around each of the keys on his ring-set and, more importantly, what they unlock! There’s a “zippenburger” that takes him to work every day; an amazing rocket which he uses to harvest and collect space noodles; he uncovers an incredible treasure box buried in a dense a creepy jungle; he gains access to a chocolate biscuit factory and taste tests all the products; and he visits a paddock where he takes rides on a huge woolly mammoth that only eats yellow coloured food. Masterton’s Josh Morgan is an illustrator with a modern but retro touch. His illustrations added levels of familiarity and a twist of quirkiness to the story, without distracting from the topic at hand. Fans of the band Urban Tramper might recognise his style from their album artwork. He’s branching out into children’s books with refreshing originality. The pictures are bright and colourful without giving too much away. His use of watercolours was a bold choice, but warranted here, as other illustrators could be tempted to go overboard on the detail and spoil the child’s right to use their own imagination to fill in the gaps. I love Sacha Cotter’s vibrant and vivid imagination. Cotter works in libraries and she has a Graduate Diploma in Teaching and Learning, with experience teaching both here and in Spain. 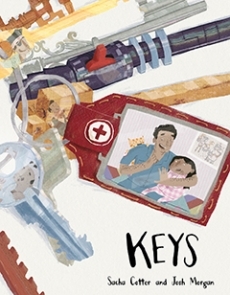 So she knows about the love of a good story, what it can do for children, to expand the mind whilst focusing on the everyday and mundane – like keys. She’s also done some film work, including the screenplay ‘Wasabi Peas’, which was a semi-finalist in the LA Comedy Shorts Film Festival 2013. This might be Sacha’s first book but it won’t be the last and I’m looking forward to seeing where she goes next. And so is my four year old! (Incidentally, this one’s available in te Reo as well. Extra bonus!). This entry was posted in Book review, Picture Books and tagged fantastical, huia publishing, Josh Morgan, Keys, Sasha Cotter, tim gruar by booksellersnz. Bookmark the permalink.